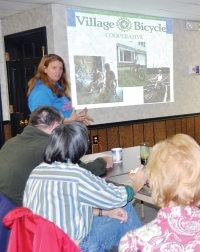 Jennifer Smillie highlights the Village Bicycle Cooperative's accomplishments. On Oct. 23, Village Bicycle Cooperative celebrated its second-year anniversary with a meeting and refreshments in its shop on the ground floor of the Bay Community House. The presenter and founder, Bay resident Jennifer Smillie, recapped what has happened, especially in the second year, and answered questions from the more than 30 people in attendance. The audience included local residents, Ward 4 Councilman Mike Young and VBC board members Bob Piccirilli, Carl Gonzalez, Peggy Ludwig and Patrick McGannon. Throughout the past year, more than 100 bikes have been refurbished and sold or donated. Community programs such as "Ready-To-Ride," which provides instruction on fixing or maintaining a bike, and "open shop” hours for community members to use the workshop or just drop by to talk about bikes, were held. Some of the future goals are to promote community rides, offer tune-up classes and continue with previous programs. Most of these events are facilitated by volunteers who are either very knowledgeable or, like me, just learning. 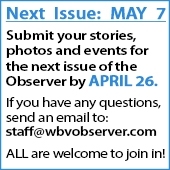 Village Bicycle is a community based organization and it needs volunteers to keep it sustainable. It is easy to volunteer and you will learn quickly because the skilled mechanics are patient and friendly. No skill is necessary to volunteer and you may actually have a fun time as you learn about bikes. The shop is open on Wednesdays from 6-8 p.m. for anyone interested in learning about the cooperative. Visit the website for winter hours at www.villagebicycle.org. I invite you to come and visit the facility and get involved! The main focus of Village Bicycle Cooperative is “to be true to the word cooperative” and have fun.